Jason Harwood is the new director of the St. John’s Men’s Chorus. He succeeds founding director, Rosemary Kinard, who retired from the chorus but continues her duties as associate parish musician. 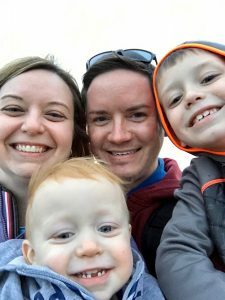 Jason, 35, who lives in Rockwell with his wife, Chrissy, 34, and their sons, Levi, 7, and Davis, 3, is an elementary music teacher who will be at Shive and Koontz this year. He will continue his duties as director of music at Mount Zion United Church of Christ, China Grove. St. John’s members Frank and Diane Goodnight have sung with Jason for years in the Faith Fourth chorus, and Frank encouraged Jason —several times, in fact — to apply. “After interviewing several promising candidates for the Men’s Chorus director position I felt that Jason was someone that I wanted the Men’s Chorus Director’s Interview Team to have a deeper conversation with,” says Rob Durocher, minister of music. “I’ve been somewhat familiar with Jason and his work for several years through his Lutheran/musical connection to this community as well as his work as a handbell clinician at Lutheridge. He hit all of the right buttons with the interview team by sharing his background, faith and family story. We were also very pleased by his sincerity, and his pleasant, warm and relaxed engagement. Jason invites veteran Men’s Chorus members to return to sing with him, as well as any male high school age and up who is interested in becoming part of the group.